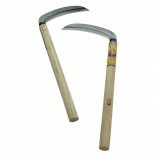 The kama (鎌 or かま) is a traditional Japanese farming tool similar to a sickle, which was also employed as a weapon by farmers. 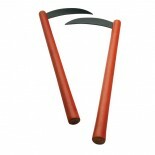 Sometimes called kai, kama made with intentionally dull blades for kata demonstrations are referred to as kata kai. 91061A Competition Natural Oak Kama w/ Grip, 10"
Unsharpened. 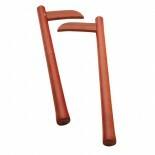 Natural hardwood Kama style handle with grooves for improved grip. Black leather wrist cord. 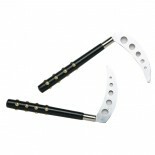 Sold in pairs ..
91061B Competition Natural Oak Kama w/ Grip, 12"
91064A Competition Black Studded Kama, 10"
Unsharpened. 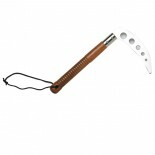 Black Kama style wooden handle with a polished finish. Chrome studs on handles for improved grip. Sold in pairs. ..
91064B Competition Black Studded Kama, 12"
91066A Competition Natural Oak Kama, 10"
Unsharpened. Natural oak Kama style handle with black leather wrist cord. Sold in pairs. 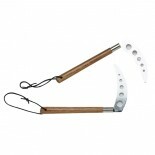 ..
91066B Competition Natural Oak Kama, 12"
This wooden blade Kama is perfect for practice and training. Sold in pairs. 18” long handle ..
Crafted from quality natural hardwood. Black steel blades measures 6 1⁄2” each. Each Kama weighs 13 oz. Sold in pairs. 18” long handle ..
Black vinyl casing with zipper closure. 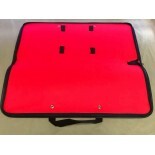 Padded red liner inside and shoulder strap for easy carry. Holding one pair of Kama. 19” x 9.5”. ..